The “Hash House” was the mildly derogatory nickname given (for its unimaginative, monotonous food) to the Royal Selangor Club Chambers in Kuala Lumpur by the British civil servants and businessmen who lived and dined there between the two World Wars, when it had become something of a social center of the times. Situated close to and behind the present Selangor Club, its function changed after independence and it became an office for the Water Board. Sadly, the “Hash House” was demolished around 1964 to make way for a new highway, Jalan Kuching, although the buildings housing the original stables and servants quarters are still in existence. The idea of harriers chasing paper was not new to Malaysia in 1938, as there had been such clubs before in Kuala Lumpur and Johore Bahru, and there were clubs in existence in Malacca and Ipoh (the Kinta Harriers) at the time. Note: the early harrier groups in Malaya were based on English public school “paper chase” or “hare & hound” runs, which date back as far as the 18th Century (Flying Booger). “Horse” Thomson (one of the Kuala Lumpur Hash House Harriers’ founding fathers) recalled being invited on a run shortly after his arrival in Johore Bahru in 1932, which chased a paper trail and followed basic Hash rules every week, but was so magically organized that it had no name. The club flourished in the early 1930s but is believed to have died out around 1935. The other branch of our ancestry comes from Malacca, where A. S. (“G”) Gispert was posted in 1937 and joined a club called the Springgit Harriers, who also operated weekly under Hash rules and are believed to have been formed in 1935. Some months later, “Torch” Bennett visited him and came as a guest on a few runs. By 1938, “G” Gispert, “Horse” Thompson, and “Torch” Bennett had all moved to Kuala Lumpur and, joined by Cecil Lee, Eric Galvin and H. M. Doig, they founded their own club, following the rules they had learnt elsewhere. Gispert is credited with proposing the name “Hash House Harriers” when the Registrar of Societies required the gathering to be legally registered. Other early members included Frank Woodward, Philip Wickens, Lew Davidson, John Wyatt-Smith and M. C. Hay. After 117 runs, KLHHH was forced into temporary hibernation by the arrival of the Japanese. Sadly, Gispert did not live to see his extraordinary creation revive, being killed in the fighting on Singapore Island on February 11th, 1942. Strangely, it took another 16 years for the second HHH chapter to be founded, in Singapore in 1962, followed by Kuching in 1963, Brunei, Kota Kinabalu, and Ipoh in 1964, Penang and Malacca in 1965. Perth, Australia* was the first “overseas” Chapter, formed in 1967. Even in 1974, when KLHHH had Run No. 1500, the HHH had only 35 chapters worldwide. Now the Hash world has over 1200 active chapters, in some 160 countries, and this despite the total absence of any central organization. We are unique! The Chicago Hash House Harriers were founded by “Sir Guy of Guy” on June 19, 1978 – we are the oldest and largest chapter of the Hash House Harriers in the Chicagoland area. The Chicago Hash House Harriers meet every week, on Monday evenings and on the fourth Saturday afternoon throughout the Summer (May-Sept) and on Sunday afternoons during the Winter (Oct-April). Membership is limited to those 21 years of age and older, and Hash Cash is only $10. Participatory Democracy – We conduct free, open, and public elections of our GM annually. Any and all hashers in good standing (those who have attended a hash in the last year) are free to declare their candidacy. In addition, we conduct regular “town meeting-style” mismanagement meetings which are always publicized in advance and all are welcome to attend and have their opinions heard. You do not have to be part of Mismanagement to attend. Operational Transparency – In all operating matters that affect the membership at large, including but not limited to internal business, finances, major initiatives, and other matters. Our Mismanagement meeting minutes are available upon request to any member of the group. 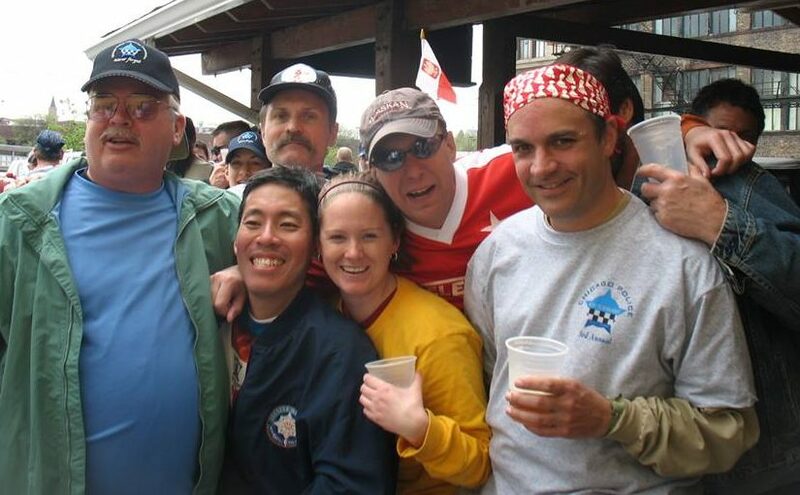 Additionally, the Chicago Hash House Harriers do not actively take any “hash tax” in order to fund “operational expenses” – all money that is collected at each hash is reserved for the purchase of beer until the conclusion of that hash. A Rising Tide Floats All Boats – The Chicago Hash House Harriers try and promote ALL Chicago area hashing events that we are aware of, as long as those hashes are not occurring concurrently to Chicago Hash House Harriers runs. We strongly believe that not every hasher can attend every hash, but that should not mean that a given hasher does not have the right to know about all of his hashing options. The success of the Chicago Hash House Harriers does not exist in a vacuum and does not come at the expense of the other hashes in the area. We want people to come to the hash of their choice (hopefully ours) because they’ve surveyed the hashing landscape in Chicago and determined that we are the best. If folks choose other hashes that’s cool also and just means we could be doing a better job of this.